Two NFL teams should get their bags packed and start prepping for Super Bowl 53 if the odds are any indication. 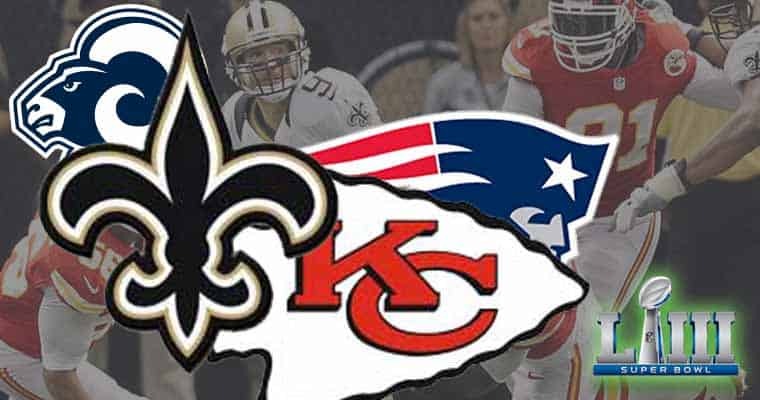 After the playoff games on Sunday, the conference championship winners will advance to Super Bowl LIII, and bookmakers currently have the New Orleans Saints coming out on top in the NFC and the Kansas City Chiefs representing the AFC in the biggest sporting event of the year. There hasn’t been much line movement after both the Saints and Chiefs opened as 3-point favorites over the Rams and Patriots, respectively. The Rams-Saints line has shifted by a half-point, making the Saints a 3.5-point favorite at the time of writing. When looking at the money line, the Saints are (-170) and the Chiefs are (-145) for Sunday’s games. When converting those into win probability and taking the juice out of the line, the folks at Bovada are giving the Saints a 61.5% chance to win against the Rams and the Chiefs have a 57.4% chance to beat the Patriots. These odds are not weighted heavily toward the favorites, and that’s to be expected since the top four seeds in the 2019 NFL Playoffs. The wild card round provided some early fireworks but the divisional round was straight chalk and all the favorites made it to the conference championship. The difference in talent in both matchups is somewhat negligible – especially at quarterback, which sees Tom Brady vs. Patrick Mahomes and Jared Goff vs. Drew Brees. All four quarterbacks are in the upper echelon of signal callers in the NFL, meaning the team with the better pass defense will likely come out on top this weekend. Below is the complete betting line at Bovada for each of the 2019 conference championship games and updated odds for the games can be found here. Super Bowl Bets Based On Hate Or Facts?